We have a little seep at a low place in the field where a little water runs all the time, a place ideal for small frogs. I love to hear them sing. They are mostly tenor and mezzo soprano, and proud of it. This time of year they are in celebration mode. The sound of their music carries a long, long way. My love for tadpoles had its origin in my childhood. Mama found some frog eggs somewhere and brought them home. She put them in a deep dish on the back porch and forbade little hands to touch. That spring we watched with wonder as the eggs hatched and the little tadpoles put on their front legs, then their back legs, and their tails went away. Mama put a rock in the dish so the little frogs could climb out of the water when they were old enough. By that time she had placed a scrap of screen wire over her miniature pond to keep the little critters from jumping out. They were little bitty fellas, about an inch long, more or less, roughly the same size as these that are hatching right now. The adults are small, about four inches long until they jump and then they spread out quite a ways. I see them sometimes as I walk by their little home, jumping from the bank into the water. They are afraid of me. 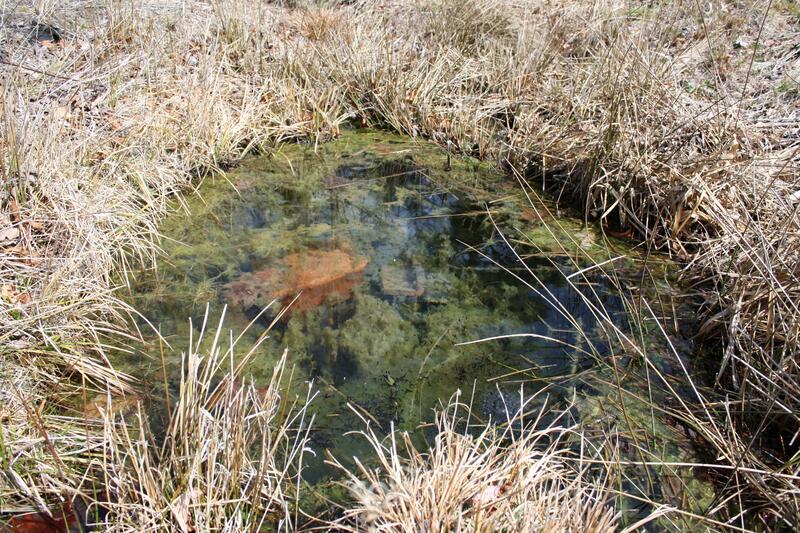 Before long the algae will thicken along the edges of their pond and you won’t see them very much. Tadpoles eat algae as they grow. Perhaps big frogs do also. I am not sure. 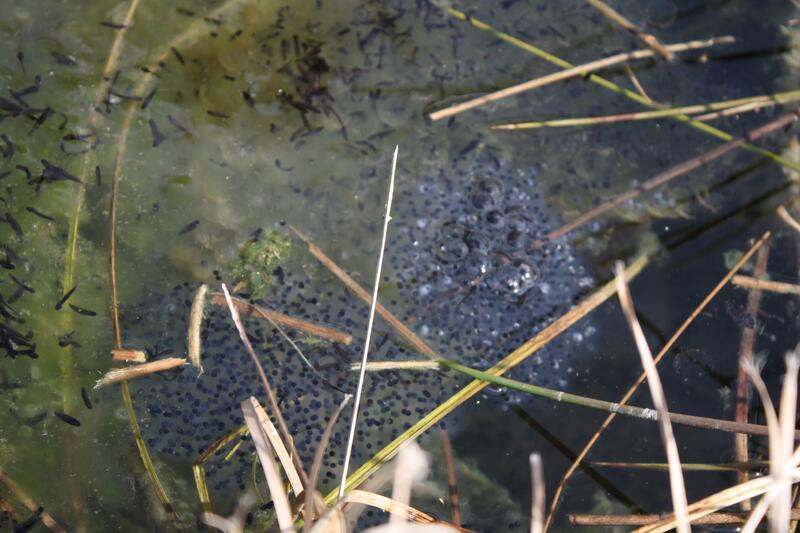 It looks like hundreds of tadpoles hatch, but we don’t end up with very many frogs (which might be a good thing, when one thinks of the plague of frogs in Egypt; they were even in the bread dough.) (Exodus 8:3) Snakes and other predators perhaps eat them. March is concert time, and we are enjoying the music. Grandma always said the opera music Grandpa listened to sounded like frogs. Could be true; their song is really lovely.